The global freeze dried food market is expected to witness an estimated CAGR of 7.01% during the forecast period. With growing urbanization and increasing population of working women, the demand for processed foods in the market has seen a remarkable boost. The expanding food processing sector and the huge demand for ready-to-eat food products among consumers have considerably increased the demand for freeze-dried products. The major restraint for this market is the high-energy requirements of such processes, which increases the product costs. The availability of other drying techniques, such as spray drying, are impacting the market since they are relatively lower in costs as compared to freeze-drying. There has been a surge in the market for all forms of preserved food, owing to the trend of increasingly busy lifestyles. This, in turn, has resulted in increased demand for quick meal solutions and convenience food. Since preserved food products are easy and fast to prepare, they offer a perfect solution to this problem. Freeze-dried fruit is the largest segment, by type, accounting for almost 53% share of the overall freeze-dried foods market). Most of the freeze-dried food processing is concentrated with the freeze-dried fruit segment, because of the ability of these fruits to retain most of the original taste. The texture of freeze-dried fruits is also crispy and their chips-like form appeals to many consumers. Asia-Pacific is the fastest-growing market for freeze-dried foods, among other developing regions, globally. It accounted for 21.81% of the total market share in 2016. The market for freeze-dried foods in Asia-Pacific is growing, owing to the rising economy and changing lifestyles. The increasing workload of consumers and rising number of working women are contributing to the growth of the market. Asia-Pacific is segmented into China, India, Japan, and Australia. 2017: Nestlé had acquired a majority stake in Blue Bottle Coffee, a high-end specialty coffee roaster and retailer company in Oakland, California. 2017: Unilever had signed an agreement to acquire Brazilian natural and organic food business, Mãe Terra. Major Players: Chaucer Freeze Dried, OFD Foods Inc., Dohler, Nestle, and Unilever, among others. 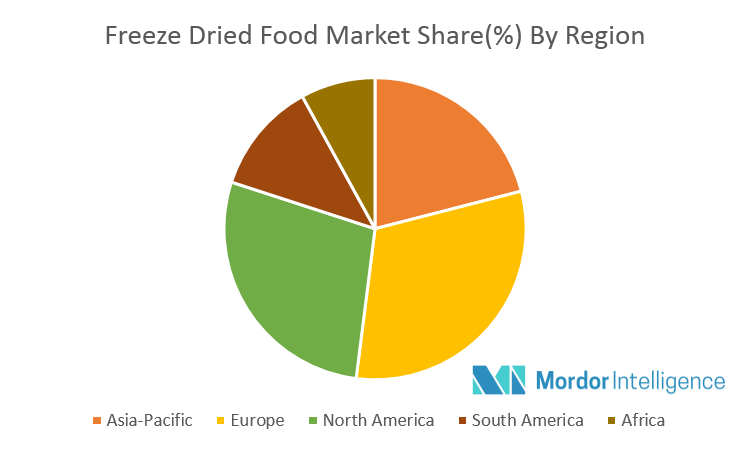 These players occupy a total market share of 59% of the global freeze-dried food market. The rest of the market is occupied by smaller players, who also has a good presence. Majority of the manufacturers focus on freeze-dried fruits, dairy, dairy culture, meat/seafood, and coffee products.